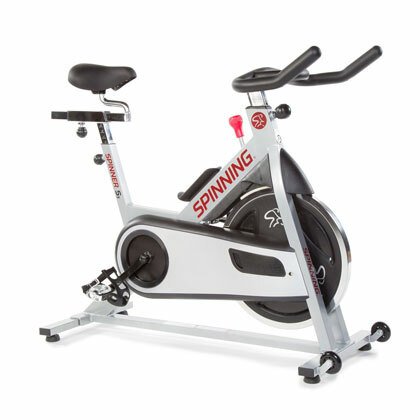 Just like the Spinner S1, the S3 model is one of the indoor cycling bikes in the Lifestyle Series. Despite the fact that it’s a bike designed for home use, it features a solid construction, pretty close to the commercial grade models, excellent micro-adjustability and can accommodate a wide range of users. 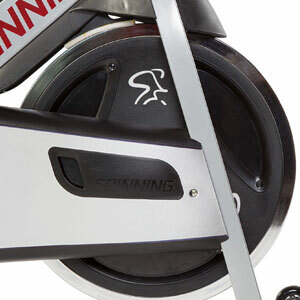 The Spinner S3 indoor cycling bike is one of the smallest models available at the moment. It’s only 43″ long and 18″ wide, which means it can fit easily even in a smaller room or apartment. Nonetheless, even though it’s not a large fitness machine, it does weigh 96 lbs (43.5 kg), weight which plays an important role in its overall stability. In fact, its construction and overall sturdiness is similar to a gym grade bike. The bike’s frame is made of steel, coated with corrosion resistant and scratch resistant paint, metallic silver in color, this being the only color available for the S3 model. The only exceptions are the seat and handlebar posts, which feature a chrome finish. The bike’s bases are equipped with adjustable, rubberized stabilizers, which provide an excellent grip onto the floor, also preventing scratches. Differently put, even if you don’t place this exercise bike on a mat, it shouldn’t slide over during a more intense workout. The front base tube also integrates a set of silicone wheels, meant to facilitate the relocation of the assembled bike. By leaning it forward on its wheels, you’ll basically handle less than half of its total weight. This Spinner bike features a 4-way adjustable seat. 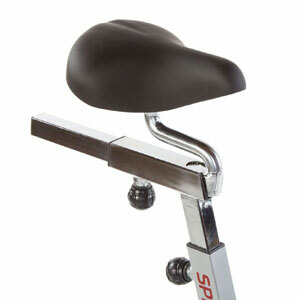 The saddle is slightly different than the average spin bike seat. It’s thicker, designed to provide more comfort. It’s connection system to its post simple, thus it can easily be replaced. The bike’s handlebar offers a multi-grip design, integrating unified aero-bars. It’s only 2-way adjustable (up, down), but does offer 6 adjustment positions. The handlebar is completely covered by a sheet of rubber foam material to provide a non-slip grip and protect the hands from damage during longer workouts. Both seat and handlebar are equipped with pop-pins, easy to grip and turn. Therefore, you can adjust the bike’s dimensions in less than a minute. Considering the adjustment span of the seat, and the span of the handlebar, this bike can accommodate users in a range between 4’10” (147.3 cm) and 6’7″ (200.6 cm). One last important aspect to mention here, regards the shape of the seat and handlebar posts. They’re both rectangular, which means it’s basically impossible for them to twist sideways. This also plays an important role in the bike’s overall sturdiness. 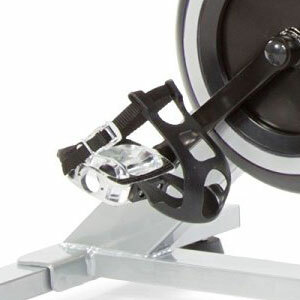 The Spinning Spinner S3 indoor cycle trainer is equipped with a chain drive system. This means it supplies a smooth ride, similar to a road bike. The flywheel is a medium size one, weighing 31 lbs (14 kg). However, it’s perimeter-weighted, which means it supplies a steady motion and a consistent momentum. Since this cycle trainer doesn’t have derailleurs like a road bike, pedaling in reverse is possible. However, resistance remains constant when you backpedal, given by the amount of friction applied onto the flywheel. Differently put, you cannot coast on this bike. The pedals will continue to spin for as long the flywheel is spinning. Since it’s an indoor cycling bike designed to support spin workouts, the crankset equipped on it is extremely durable, featuring solid steel crank arms. It can support users up to 250 lbs (114 kg) in standing up pedaling routines with no problem. The crank arms are equipped with metallic pedals, with straps and toe cages. The pedals don’t have clips for spin shoes. However, they feature standard threads and can be easily replaced. The Spinner S3 features a friction resistance system, which consists of a leather or felt pad attached to the main tube of the frame, and the resistance knob that goes through it. The pad comes in contact with the flywheel in a top-to-down manner. By twisting the knob clockwise, the pad applies more pressure onto the flywheel increasing drag and the overall resistance on the bike. Just as for many other indoor cycling bikes, the aren’t any resistance levels (or clicks) specified on the resistance knob. You simply turn it until you find the suitable tension for your workout. You can basically apply enough friction onto the flywheel up to the point you can’t pedal anymore. The resistance knob also fulfills the role of an emergency brake. As we’ve mentioned above, the bike’s pedals will continue to spin for as long the flywheel is spinning. So, in case you need to interrupt your workout, or you want to reverse your pedaling motion, it’s recommended to use the emergency brake, to prevent any accidents. This Spinning bike doesn’t include a fitness meter. There are several models available separately. The only accessories that come with it are the bottle holder and a set of DVDs with spin workouts. The bottle holder attaches to the main tube of the bike, right under the resistance knob, similar to the placement for a bottle holder on most mountain bikes. The DVDs include various spin workouts. They’re quite great to train with. They actually generate the atmosphere of a real spin class, and will considerably help with your results. The DVDs include Ultimate Energy, Train and Tone, Turn and Burn and Maximum Results workouts. Some of the parts come already assembled. The flywheel, the chain, resistance system and crankset are already attached to the main frame. Thus, for assembly you only need to place the frame onto its base tubes, attach the seat post, seat, handlebar post, handlebar and the pedals. This shouldn’t take longer than 30 min. A manual that provides comprehensive step-by-step assembly instructions and the tools required for it are included. Just as for any bike that involves a chain, the chain requires lubrication from time to time. However, as we’ve mentioned above, the bike’s chain is pre-lubricated and shouldn’t require any lubrication for at least a couple of months. The brake pad may also require lubrication, in case it emits a squeaky noise when in contact with the spinning flywheel. For this, a silicone-based lubricant is recommended. Fitness computer unit not included. 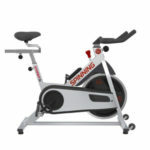 The Spinner S3 is a spin bike designed for home use. It features a solid construction, similar to the commercial bikes, however with a lighter frame, able to support users only up to 250 lbs. It uses simple friction resistance, features a mid-size flywheel and a chain drive. It’s an excellent indoor cycle trainer for muscle toning, cardio and interval training, and of course, for losing weight. It’s not exactly the most affordable exercise bike, but it’s an authentic spin bike, and quality definitely stands up to its price.